THE INVENTION OF THE TELESCOPE has been by far the most revolutionary development in the history of astronomy. For thousands of years, astronomers had to rely on their eyes in unravelling the mysteries of the Universe. The telescope revealed an embarrassment of astronomical riches, and led to a dramatic increase of knowledge about the wider world we live in. The Eyes on the Skies movie is presented by Dr. J aka Dr. Joe Liske from ESO, host of the Hubblecast video podcast. The DVD runs for 60 minutes and contains subtitles in several languages. 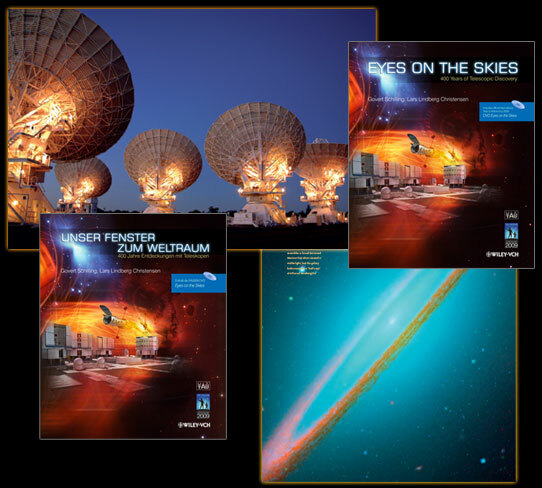 The Eyes on the Skies book is available in English, German, Finnish, Korean, Japanese and Chinese.